Risk managers should also know in advance the steps that need to be taken because a loss closely following a devaluation could be devastating. But there is no denying the fact that during the previous devaluation the rupee weakened to Rs105 from Rs98. They warned that in the immediate term the devaluation would result in increase in inflation which was one of the main reasons behind government's reluctance to allow this move as it risks stoking public anger. However, the devaluation took place in 70s and 80s. Our analysis suggests currency pressure is greater in CEMAC than WAEMU, while of the 14 countries in these currency zones Congo is by far the most vulnerable to devaluation. But, without entering the technical weeds of economic analysis, it is clear why a devaluation strategy is a loser's game. A devaluation of 15 percent will reduce imports and increase exports but will not be nearly enough to eliminate the trade balance deficit that in 2015 stood at over $25 billion. 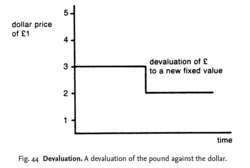 A gradual devaluation of the currency could be beneficial for three main reasons. The impact of a devaluation depends importantly on the pricing policy of the exporting companies. The recent devaluation of the yuan (and the follow on devaluations by Vietnam and Kazakhstan) has kindled fears of a currency war. BAKE[pounds sterling] (CyHAN)- Fitch Ratings international rating agency doesn't expect further devaluation of Azerbaijan's national currency (manat), Dmitry Vasiliev, director of the agency's Financial Institutions said in an exclusive interview with Trend Sept. While commenting on the current Yuan devaluation policy of China, he said that other strategies such as policy rate cuts and interest rate relaxations in Pakistan have not helped exporters because government borrowings and reliance on banks have always dominated the lending scene.